Ranked with 5 stars rating, this Fidelity GNMA Fund uses its assets to buy assets in Ginnie Maes. Its benchmark is the Barclays GNMA Index. The fund managers are William Irving and Fanco Castagliuolo. The total assets are $10.9 billion. Its expense ratio is 0.45%. The yield is 2.38%. The fund’s shares price is valued at $11.72 (1/21/2013). 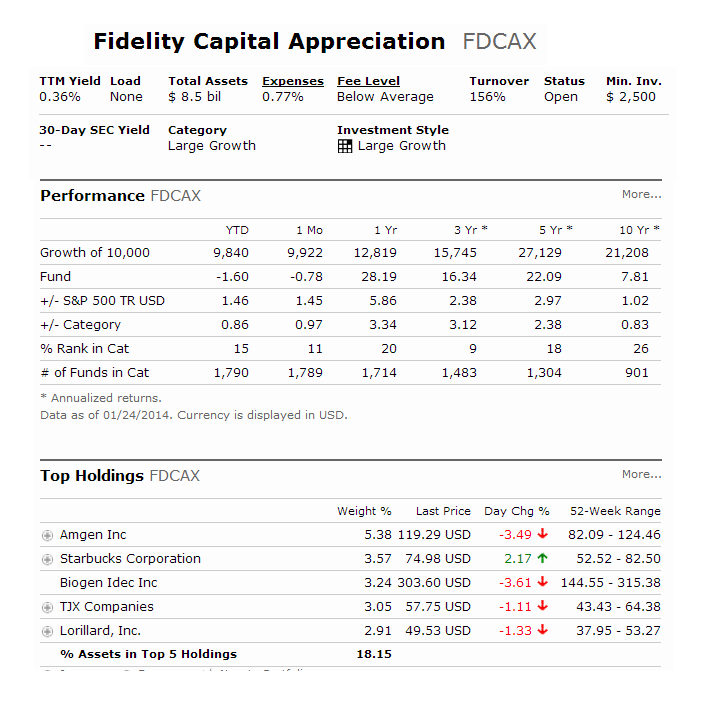 Fidelity Capital Appreciation Fund is the top ranked large growth mutual fund. Its expense ratio is 0.95% per year. Its fund objective is to provide capital growth through investment in common stocks of foreign and domestic companies. The fund dividend yield is 0.56%. This best domestic stock fund is managed by J. Fergus Shiel since 2005. This best Fidelity mutual fund for 2013 has 1 year annualized return of 12.03%. The 10-year average return is 9.48%. As of January 2013, the top 5 stocks in its portfolio are Apple Inc, United Continental Holdings Inc, Amgen Inc, General Electric Co, and TJX Companies Inc. The top 3 major market sectors are consumer discretionary (30.60%), health care (13.22%), and industrials (12.75%). Fidelity Municipal Income Fund is an NTF mutual fund. As the top Fidelity fund pick, it invests mainly in investment-grade municipal bonds whose interest is exempt from federal income tax. This muni national long mutual fund has yield of 3.53%. The total assets are $6.78 billion. It also has 0.46% expense ratio. You can buy this best Fidelity mutual fund 2013 from 63 brokerages. The minimum initial investment is $10,000. If you invest $10,000 in this fund 3 years ago, your fund would have grown to $12,286. The fund average effective duration is 7.12 years. Its average credit quality is A (investment grade). As of January 2013, the top 5 bond sectors are State and Local General Obligation, Health, Education, Transportation, and Water & Sewer. It is also suitable for regular brokerage account hence there is no tax on the dividend yield. Fidelity Small Cap Discovery Fund is the top small blend mutual fund. It utilizes its assets to purchase stocks of small market capitalizations companies. It may invest in domestic and foreign stocks. Chuck Myers is the fund manager. This fund also has a dividend yield of 0.91%. Its total assets are $3.91 billion. The portfolio turnover rate is only 20%. The fund’s NAV is $25.35 (1/21/2013). Ranked with gold rating, it has YTD return of 24.03% in 2012. This best Fidelity mutual fund has returned 18.76% over the past 3 year, and 12.95% over the past decade. It is available to be purchased from 67 brokerages. The 3 year beta risk is 1.20. As of January 2013, the top 6 holdings are Superior Energy Services Inc, TCF Financial Corporation, Berry Petroleum Co, HanesBrands Inc, Tech Data Corp, and Graftech International Ltd. The fund CUSIP number is 315912600. 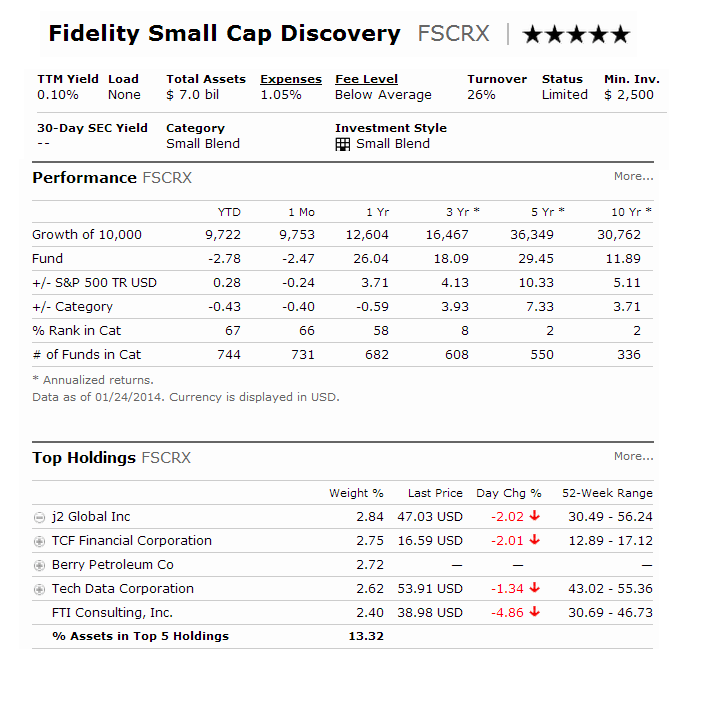 Note: Fidelity Small Cap Discovery Fund is previously as Fidelity Small Cap Retirement Fund before August 2009. Fidelity Select Retailing Portfolio fund is investing mostly in merchandising finished goods and services companies. It is managed by Peter Dixon. This best Fidelity mutual fund has no sales load. It also has $557 million of assets. Its expense ratio is only 0.88%. Its investment style is large growth. This best consumer cyclical mutual fund has 1 year average return of 12.39%. The top 3 stocks are Home Depot Inc, Amazon.com Inc, and Priceline.com Inc.